A baseball pitcher brings his arm forward during a pitch, rotating the forearm about the elbow. If the velocity of the ball in the pitcher's hand is 35.0 m/s and the ball is 0.300 m from the elbow joint, what is the angular velocity of the forearm? This is College Physics Answers with Shaun Dychko. The ball in the pitcher's hand has a linear velocity of 35 meters per second and the hand is 0.3 meters away from the elbow, and so this distance is the radius of curvature of the ball. 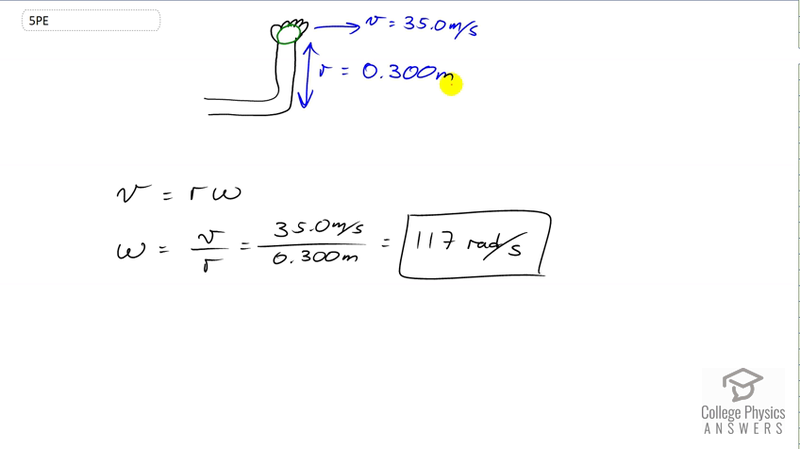 We know that linear velocity is radius times angular velocity and so we can solve for omega by dividing both sides by r. We get omega, the angular velocity is linear velocity divided by r, or 35 meters per second divided by 0.3 meters which gives 117 radians per second.